You will feel right at home in the brand new Bed and Breakfast which opened its door recently in Wierdapark, Centurion. 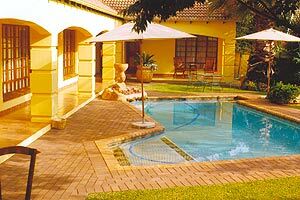 MAHANYA B&B offers stylish accommodation in five spacious rooms with en-suite bathrooms. Traditional hospitality and personal service will make your stay a memorable one. Nic and Alta Hanekom will personally attend to all your needs and ensure your stay is a relaxing and enjoyable experience. Mahanya is conveniently situated close to all main roads to Pretoria / Midrand and Johannesburg International, and within walking distance from a shopping centre and Golf Driving Range.